Scrumpy & Western website. Made In Somerset from cider! The Tinker Boys band page. Who Are The Tinker Boys? 'Scrumpy 'n' Western with a gurt dash of Irish' - imagine 'The Wurzels meets The Dubliners' and you've got an idea of what Bristolian outfit The Tinker Boys offered. Jethro Tool Of The Mangledwurzels admits having seen these chaps at the Cat & Wheel in Bristol in 2004: "They played two sets, the first was an upbeat Irish set with all the old favourites. They then got changed into their smocks and scarves and came back to perform a raucous set of Wurzels songs. 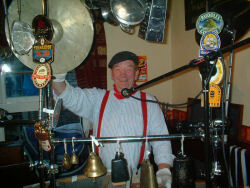 The crowd were well up for the gig, tanked up on cider and Guinness - and the same can be said for the band!" 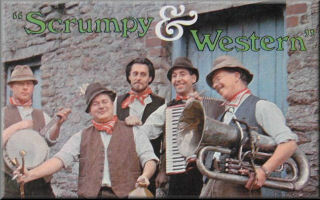 Scrumpy N Western magazine (no connection to this website) reported that the band acrimoniously split up on stage during a gig in 2006 (not very professional, as they reported); although two off-shoot bands are supposed to have arisen as a result - one being the Somerset Paddies. Their website is currently down, so it can be presumed that The Tinker Boys are no longer in action. - Roger of the Tinker Boys.